The 2013 show was a major success. I will be posting photos and articles from it in the next several weeks. I even managed two range trips: the first at Media Day (which was fun but extremely cold and windy) and the second on the day after the show. The second shoot, with 60*F weather and only friends present, was the fun one. I got to try out a number of new guns, including this three-barreled 12ga. Fun! At least with birdshot, the kick wasn’t much. Until I tried it, I scoffed at the idea but now I am more of a fan. The action is short — 3.5″ shorter than a typical pump. Each barrel has its own choke tube, so it can be used for progressively tighter chokes for hunting or with progressively looser chokes for defense. A typical hunting set-up might be #7 cylinder/#7 improved cylinder/#6 full. A typical defense load might be slug with cylinder/#000 buck improved cylinder/#buck with cylinder…or whatever other variation that makes sense to the user. The rotating strikers are similar to the old Remington derringers, with no external parts. So the mechanism is sealed against sand and the first three can be fired very rapidly. Reloading is slower than with a pump but simpler. Eventually, this shotgun would be available with ejectors which would speed up the reloading. While the rotating striker arrangement isn’t quite the duplicate firing mechanisms of the classic safari rifles, it’s very simple and doesn’t depend on recoil for re-cocking in the event of a misfire. 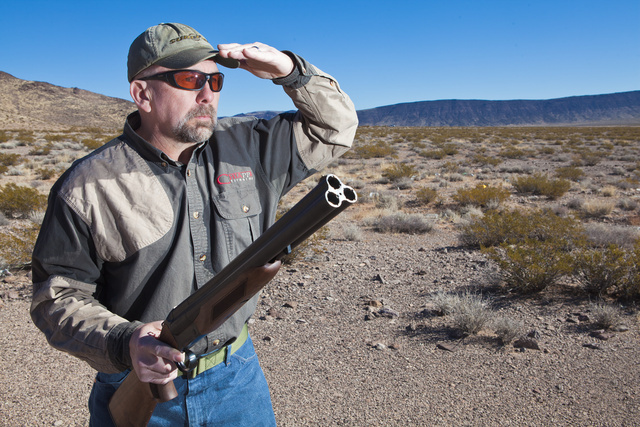 12ga 3″ slugs aren’t quite the 577Nitro, but they are adequate for North American game. DDupleks makes very impressive machined steel loads, and Brenneke and Rio both make high-penetration lead loads. You might prefer the 28″ barrel version for wing shooting, but the 18.5″ is handier in the bush. Will post photos and comments about other guns I’ve tried as I recover from the dry desert air and smoke-filled casino hallways. But for seeing friends and doing business at SHOT, I can’t recommend Las Vegas except to a complete masochist. The local culture makes New York City look almost friendly by contrast. This entry was posted in interesting people, shotgun and tagged 12ga, Chiappa, desert, Nevada. Bookmark the permalink. Pretty BA. Needs an ejector mechanism to speed reloads. I want a tri-barreled 4-bore rifle. I want to hunt dinosaurs. Chiappa Firearms: Totally weird ideas that work. Lancaster made some rotating firing pin four barreled game guns in the late 19th century. Neat revival of the classic drilling, but I think the single barrel placed underneath would sit better in the wood forend and not make the gun so “tall”.